This Christmas, turn your favorite holiday drink into sweet, wreath-shape cookies complete with aromatic nutmeg and red and green candied bows. In a large mixing bowl beat butter with an electric mixer on medium to high speed for 30 seconds. Add the granulated sugar. Beat until combined, scraping sides of bowl occasionally. Beat in egg, vanilla, salt, and nutmeg until combined. Beat in as much of the flour as you can with the mixer. Stir in any remaining flour. Divide dough in half. Place half the dough at a time in a heavy resealable plastic bag or a pastry bag fitted with a 1/2-inch round tip. Cut a 1/2-inch hole in one corner of the bag. Pipe the dough into the ungreased cups of a mini doughnut pan, filling the cups to the rims. Bake about 8 minutes or until light golden and firm to the touch. Cool in pan on a wire rack for 5 minutes. Invert pan over a wire rack to remove cookies and let cool. In a small bowl stir together the powdered sugar and enough of the eggnog to make a dippable glaze. Dip the rounded sides (bottoms) of the cookies in the glaze, allowing excess to run off. 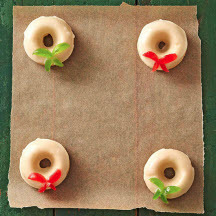 While glaze is wet, arrange the red and green candied cherries on cookies to resemble bows. Let stand until set. Nutritional Information Per Serving (1/24 of recipe): 162 kcal cal., 8g fat (5g sat. fat, 0g polyunsaturated fat, 2g monounsatured fat), 29mg chol., 122mg sodium, 21g carb., 0g fiber, 12g sugar, 1g protein.